Beautiful apartment of up to 5 people, fully equipped, allowed to cook, the most complete of the Veredas, without the afternoon sun or the noise of the swimming pools! The apartment has a bedroom (suite), two full bathrooms with hair dryers, living room, kitchenette and balcony, a queen size bed plus a single mattress in the bedroom, a double sofa bed in the living room. Equipped with safe, air conditioning in the room, 2 LCD TVs (room and bedroom), Refrigerator, Microwave, Cooktop, electric grill on the balcony, fan in the living room, table and chairs, furnished and equipped with kitchen utensils - the most complete of the sidewalks , with cups / mugs, plates, pans, cutlery, grill sandwich maker, electric grill, blender, caipirinha kit, floor clothesline, can / wine opener, pasta drainer and coffee strainer. 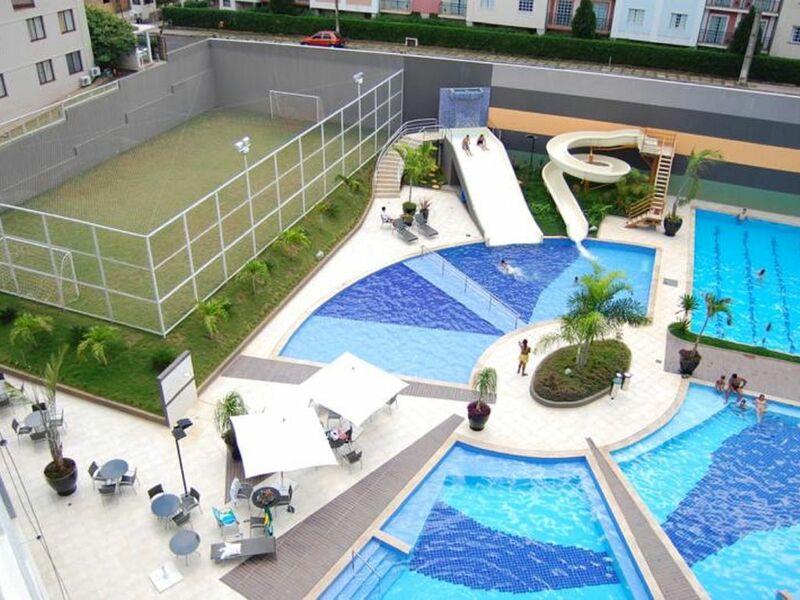 The Flat Hotel has 6 heated swimming pools, plus 2 whirlpools, water slide and slide, sauna, playground, grass soccer field, squash court, gym, cinema, game room, a free garage space, baby care / changing room equipped convention hall and is only 300 meters from the Hot Park / Pousada do Rio Quente, enough to walk and save with parking. Daily maid service and cleaning included in the price. For your safety, we have safety netting on the windows and a collapsible baby crib with a mattress for babies up to 3 years of age. For up to 5 people. For more daily, New Year's Eve packages, Christmas, holidays or Carnival, please contact. Take advantage of low season promotions! Take the opportunity to know the most Thermal resort in the world, knows the Hot Park with savings of up to 90% compared to staying in hotels in the Pousada do Rio Quente. And in the days to solve stay at the Hotel, the Veredas has all the leisure and comfort for your family enjoy, enjoy, relax and unwind. I can help you plan your trip, give advice or information you need. Apartment facing the street, do not take the sun of late, so without the hassle of excessive heat or the noise of the pools and more privacy. Pay with your credit card via Paypal or PagSeguro UOL, through the site safely and can parcel with the fees charged by these sites if you use these forms ask for the link ..
2 bathrooms one in the room and another in the suite, both with shower. very good space, new facilities, daily housekeeping, wonderful place to enjoy and relax with family and most economical option to visit the Hot Park. Proprietario muito atencioso,local limpo e organizado.Gostei muito. O proprietário é muito atencioso e seu apartamento bem cuidado. Mas o complexo está muito mal administrado. Piscinas sujas, uma interditada por 3 dias para limpeza, que não foi feita. O parque aquático para crianças só é ligado se você ficar no pé dos funcionários, mesmo assim tiveram dois dias que o funcionário simplesmente foi embora e o parque ficou fechado. As crianças ficaram bem chateadas e sem atividade. A escada que sobe para o toboágua está enferrujada, um grande risco para as crianças. A sauna não está funcionando. Tive informações de outros hóspedes que já haviam se hospedado outras vezes lá de que o complexo era muito bom em tempos pretéritos, mas atualmente está muito mal administrado. O proprietário foi muito atencioso e prestativo, os colaboradores do Flat muito profissionais! Fico feliz que tenham gostado, aguardo seu retorno! Just 300 meters from the Hot Park, enough to walk and infrastructure to also enjoy the Apart Hotel and its pools on your trip. Close to bakeries, restaurants and local shops. With sauna, several pools, a gym, cinema, baby care, new super structured and furnished, with savings compared to staying in hotels inside the inn Warm River.